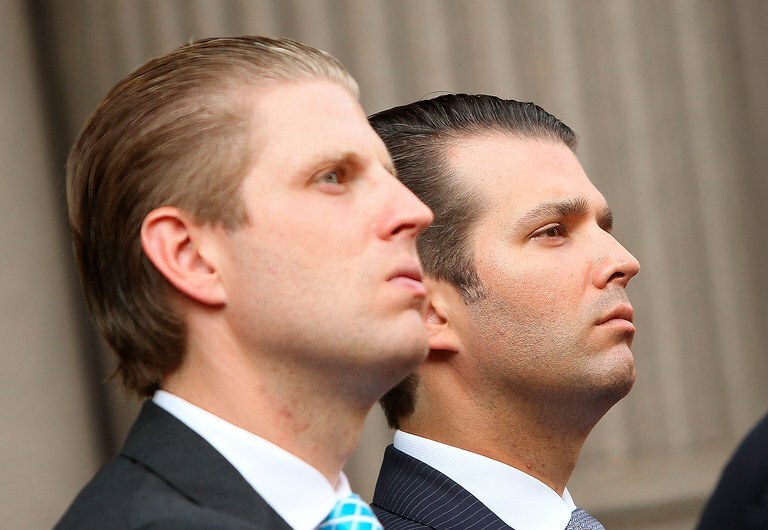 An Immigration and Customs Enforcement (ICE) error reportedly separated Eric and Donald Trump Jr. from their parents when they wandered off as the family entered the United States from an overseas trip. The eldest sons of President Donald Trump and stepmother Melania were said to be visibly distraught as they were whisked away while the President was preoccupied searching the tarmac for the First Lady. The source for the report, a high-ranking Homeland Security official, was in the room when the terrified boys were brought in. Despite their plaintive wails and unaware of their lineage an ICE agent told them in both Spanish and English of the possibility they may never see their parents again. The two were also made aware that as their case was processed they would likely be housed in the toy department of a converted Walmart with the offspring of other detainees. When told of his sons detention President Trump was forced to suspend the search for his wayward wife and intervene. Shortly after that the boys were allowed to leave the holding facility accompanied by Vice President Pence and a change of clothes. The White House had no comment when asked about the incident nor did the current Mrs. Trump who was later found leaving a personal trainer’s studio in SoHo. This entry was posted in Legal, Politics, Satire and tagged Donald Trump Jr, Eric Trump, ICE, Melania Trump by gprowler. Bookmark the permalink.